It’s fairly obvious by now that iOS(s aapl) and Android(s goog) are the top dogs in mobile, so the battle is on for the third platform player. I wrote off BlackBerry(s rimm) a while ago, and got some confirmation of that Thursday. Windows Phone(s msft) is looking better and better to be No. 3 to my eyes, but mobile analytics firm Flurry suggests a different player. Based on 11 million data points, Flurry suggests that Amazon is the one to watch, even though its “platform” is built upon Android. 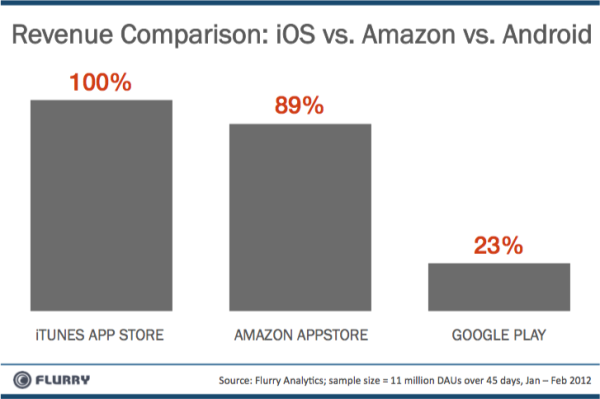 The key stat from Flurry’s research is a look at apps that are available in the iTunes App Store (s aapl), Google Play (formerly known as the Android Market) and Amazon’s Appstore(s amzn). Not surprisingly, the same app in all three stores makes more money — specifically through in-app purchases — in iTunes, so Flurry used this data as a baseline, setting iOS revenues to be 100%. It turns out that in this situation, Amazon Appstore revenues are 89 percent of iOS revenues, while Google Play yields only 23 percent. Another way to interpret the results is that for every $1.00 an app generates in the iTunes App Store, it generates $0.89 in the Amazon Appstore and $0.23 in Google Play. These results illustrate two very important trends. 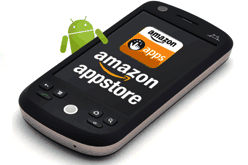 First, it may make sense for developers writing Android apps to get them in Amazon’s store sooner rather than later. Second, it shows that making money on Android apps is possible; the same title can make almost as much money as its iOS counterpart. Granted, working with Amazon may not be ideal to some, given that Amazon can set the app price. But giving up that freedom may prove financially beneficial in the long run thanks to Amazon’s constant promotion of mobile apps. I think that’s part of the success factor here for Amazon apps. For all intents and purposes, these titles are the same Android apps found in Google Play. Google isn’t known as a brand for digital media and apps, however. Instead, it’s commonly considered to be a search company first and everything else second. Compare that to Amazon, which is a top retail brand around the world: Last year, Amazon’s brand value surpassed that of WalMart(s wmt) to take the top retail brand spot. This mindset, that Amazon is a safe place to purchase digital content — think e-books, music, and video — extends to apps and in-app purchases, even if they’re the same wares found in Google’s store. Clearly, consumers are comfortable with Apple’s brand and store too, so devs may want to focus on iOS and Amazon when it comes to mobile apps. If developers knew how Amazon’s self publishing DVD arm abruptly changed the percentage payed to authors back in 2006-2007, they would think twice about signing products with them. Authors went from 40% of sales to 30% of sales overnight, on an abrupt notification. It was a bit of a surprise when it happened to me. In today’s world, I will never publish any apps thru their stores -because of this. The terms of service agreement change awaits. A lot of repetitive information in this article. That’s the power of the editorial team that we see in NYTimes in terms of enforcing substance and structure. This is a pretty terrible attempt at interpreting data. Amazon’s revenue per app says nothing about how much developers are making. It means Amazon is selling more paid apps (it has very little interest in free apps because it doesn’t run a big mobile ad business) than Google, big surprise. Amazon is also giving away developers’ apps for free, something that costs them sales and costs Amazon virtually nothing. That’s not good for developers. So please, try again. How is Amazon’s tiny fraction of iOS sales good for Android developers? Amazon is earning itself more revenue per app than Google, but less than Apple. Now recall that Apple isn’t running the App Store to make big revenues. It’s working to break even, as it aims to do with the rest of iTunes. Apple makes money on hardware. So digest that one more time: Apple is making more money without trying, while making lots of money on iOS hardware. Amazon can’t even make itself as much revenue per app, but is selling the Kindle as a loss leader. Once again, how is this good news for Amazon, its developers, or Android itself? This is nothing but more statistical nails in the coffin. As someone who has the same app (paid, no IAPs) in all three stores, the flurry analysis is way off. Google Play is at roughly 10% of iTunes store and Amazon Marketplace is at about 10% of Google Play. To say that Windows Phone is anything near becoming a third player in the app market is fanciful. Windows Phone does not have a natural ecosystem. The market was created with Microsoft cash (eg that’s why Angry Birds was ported). It’s a great way to kickstart, but the problem is it’s unsustainable. Windows Phone handset sales are still rock bottom (sub 2%). Microsoft cannot continue to pour massive amounts of cash into its market without increased handset sales. I mean, it’s being beaten by Samsung’s Bada. that says it all. One can’t help but wonder if Amazon may develop their own OS – AOS? – since they probably won’t want to be at Google’s mercy for long. Perhaps develop their own particular branch, similar to Linux/Unix and all the different flavors of each that exist today. Isn’t Android itself based on Unix? I must admit I am confused as to what these numbers represent. At first glance at the labeling involved, it looks like the Amazon App store earns 89% of what the iTunes app store does, which cannot be true. Upon further reading, it appears to have something to do with in-app purchases, but it’s kind of impossible to really know for sure. Sorry if I appear ignorant but the wording of the article doesn’t help. At any rate, if it is a statistic only for in-app purchasing, then it is probably meaningless (despite the author’s assertions that it’s indicative of a trend). To take a small subset of data and make it fit a certain conclusion and then to write an article about it is probably not a great idea. It really sounds more like wishful thinking than anything else. It’s also revenue per user on average. So even if the Play Store has 10,000 paying users, and the Amazon app store has 100 paying users, going by the way this data is presented, you’d think the developers make more money in total from Amazon than they make from the Play Store. But that’s not true, and I’m pretty sure it’s quite far from being close to the total Play Store revenue, too, considering there are 60 times more Android users than Kindle Fire users. But as I said, the Play store is not very efficient in monetizing apps, with an “efficiency” of 23%, while the Amazon App store has an efficiency of 89% (in relation to the iTunes sales). The guys from Flurry stated here or elsewhere that this is data from before the “Play” initiative from Google. I don’t think it’s really about the “willingness to pay”, but more about the hassle free payments on both the iTunes store and Amazon, because when you sign-in with an iTunes account or an Amazon account, you’re pretty much set to start paying for apps. That’s not true on Android unfortunately. You still need to make a Google Checkout (Wallet?) account, and a lot of people prefer to stick with free apps than go through that process of using a payment account that they can barely use anywhere else. Amazon and Apple’s previous payment ecosystems are really helping their mobile platforms here. Since Google pretty much abandoned Google Checkout since it first came out, and did nothing with it, now they can’t leverage it to get Android users to pay for apps. Plus, they also have a different incentive – that of getting people to use free apps with ads, rather than pay for them, where I doubt they even make any money because they give most of it to carriers or manufacturers. So if Google really wants to help developers make money, they need to make Google Wallet a very popular payment platform for a lot of other things, not just Android, so people have a reason to use it. Either that, or they need to make Paypal one of the default payment methods on Android. I also agree with the other commenters here that Flurry’s data is usually pretty misleading, and you should take it with a grain of salt, at least until you try to to really understand what they’re showing with their data, before making very general assumptions based on that data. That being said I don’t think the Play Store is as efficient as it can be for monetizing apps, and one of the main reasons is the payment method, as mentioned in my other comment. It looks great from first point of view – but what I lack is methodology, how those guys from Flurry got those numbers. Right, Flurry knows number of instances multiple price of app. But – there is one BUT. If you look to Amazon App Store, they have everyday Free App Of Day. It is normally paid app, discounted to 0. What I read posts from guys, that were chosen to this free app of day, they sold for “0” ten thousands of copies in this day. But before / after this promotion, just few peaces in a day. I just wonder, if Flurry can count with this. Because if not, the numbers doesn’t show nothing. Jindrich, this data has nothing to do with the price of a paid app; it’s only looking a revenues from free apps with in-app purchases; a fast growing revenue stream for devs on all platforms. Yes it’s about the ecosystem play, but it goes deeper than that. I see two areas that might be causing this trend. The first is that people likely feel more secure paying for apps when they are curated. This process mostly eliminates “problem” apps and gives consumers a sense that the app has been vetted. Number two, and this is wild speculation on my part, is that people getting Android devices on the cheap (<$100, BOGO deals etc.) are very likely not interested enough to even realize that there's an amazon app store. This group seems much more likely to get everything straight from the included store, and less likely to be seeking premium apps that cost money. So developers can earn more developing apps on Android and publishing on two stores than developing for iOS? I’m reading report again and again and it conclusions doesn’t make sense for me. Even if we assume that Flurry’s dataset is statistically valid (which is probably not) nad keep in mind that that in-app purchases aren’t counted, the report says that Amazon appstore revenue is bigger per user not overall, which is hardly surprising. But what we actually want to know is gross revenue. They made me change a link in a flash game on facebook that sent users to the Android marketplace rather than the Amazon appstore. when my game “Lock ‘n’ Roll” was the free app of the day. I think it’s misleading to view a comparison based solely on apps that concentrate on one form of revenue (in app purchases) and then make a sweeping generalized statement such as “so devs may want to focus on iOS and Amazon when it comes to mobile apps”. Instead, that statement should be as specialized as the comparison. “So devs may want to focus on iOS and Amazon when it comes to creating mobile apps who’s primary revenue structure is based on in-app purchases” would be more proper. phor11, that’s a valid point, but my reasoning was this; apps in general are starting to make more revenue through in-app purchases than up-front sales. We’ve run a number of recent posts on the success of this freemium approach, which is gaining momentum. Hope that explains my thought process… thanks! Wow, that’s interesting if true. I hadn’t even thought about that as a possibility. After reading this, I asked all my friends if any of them has ever made an in-app purchase, and 100% of them said “no”. The VAST majority of them had paid for at least one app outright in their respective app stores though. So I’m still pretty skeptical. I said this in Stacey’s report on Google selling Nexus tablets yesterday. It’s about the ecosystem. Apple and Amazon both have one and it apparently attracts users who are willIng to spend more. This benefits both Amazon and Apple as well as developers for those platforms. And leave the other manufacturers on the outside looking in. Completely agree, Travis. Neither hardware nor software alone is enough to compete today, the third piece of the puzzle is the ecosystem, which Amazon has leveraged Android for quite well so far.